Though this article shouldn’t affect people who have a fear of heights, but it’s better to be safe than sorry and proceed with caution. The closest way to imagine what it feels to stand about 200-300 m above the ground and amidst the clouds is to fly in an airplane and stare down. Our world has numerous of sky-scrapers which dominate the skies. Though it would be somewhat difficult to name each and every one of them, here in this segment we are going to bring forth the ten top skyscrapers in the globe. Just go through each one of them and be spell-bound by its aura. The building of Burj Khalifa began being constructed, in the year 2004 and the exterior was completed in the year 2009! The primary structure of the building is made with reinforced concrete. It opened in the year 2010 as an integral development in Dubai known as the Downtown Dubai. The building is named in honor of Abu Dhabi ruler as well as the president of UAE known as Khalifa bin Zayed Al Nahyan. The building shattered countless height records and is said to have about 57 elevators and about 8 escalators, each having the ability to withstand about 14 people per cabin. One of the striking points of this building is that it is designed keeping in mind the patterning embodiments of the Islamic architecture. This sky-scraper is situated in Lujiazui, Pudong in Shanghai and was made by Gensler. It is owned by group of Chinese state owned companies. The building is about 632 m and comprises of about 128 stories in total. The total floor is about 380,000 m and the real purpose of this building was to use it for high sustainability and energy generation. The construction began in the year 2008 in the month of November and is considered to be the tallest in China with being only second to the Burj Khalifa in Dubai. Though it was scheduled to be inaugurated in June 2015 but that did not happen as of early September. The Abraj Al bait towers are also referred to be as the Makkah Royal Clock tower which is mainly a government owned mega-tall skyscraper in Mecca, Saudi Arabia. They are a part of King Abdul-Aziz endowment project which aims to revolutionize the city. The building comprises of a central hotel which is said to have the tallest clock face and which happens to be number three in the tallest buildings and the number four among the loftiest free standing spectacles in the globe. The building was initially planned to be 734 m tall in the year 2006 but later on got final that it would be about 601 m. It comprises of a story shopping mall and garage which can hold about thousands of vehicles. This building is in Zhen chen,Guangdong province, China. there are 115 floor and 1965 feet. Architecture firm: Kohn Pedersen Fox and owner is Ping An Insurance. This building is mainly referred to as the new World trade center construction in NYC. This is one of the tallest in the Western Hemisphere and number five in the list of all-time favorites. This colossal construction is surrounded by the West Street in the West and also the Vesey Street in the North, the Fulton Street in the south and the Washington Street in the east. Though the name of the building was initially the Freedom Tower but in 2009 it was settled that it would be referred as One World Trade Center. The entire building is of about 104 standardized floors, but actually there are about 94 floors in the tower. As per speculations, the construction of this is mainly to memorize and rebuilt the original WTC structure. The CTF finance center, earlier known as the CTF Guangzhou, Chow Tai Fook Center is primarily a sky scraper which is being constructed in Guangzhou China. After completion it will be second of the Guangzhou tower sky scrapers over shadowing the Pearl River existing in the same region. 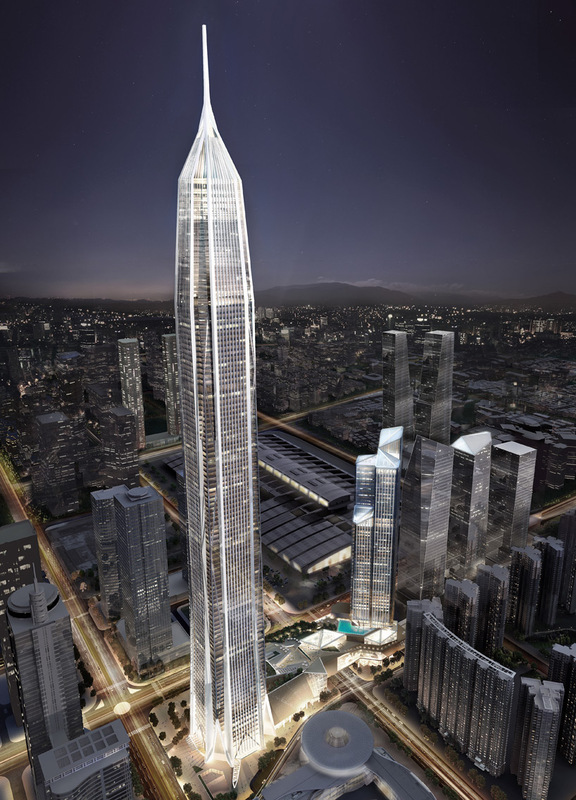 The total height is about 530 m having about 111 floors and with the reports gathered is said to be complete in 2016. The purpose of the building will mainly be for a conference center, mall, office and also an observatory. The hotel component will mainly be the Rosewood Hotel and resorts comprising of about 251 guest rooms and 355 residencies lodging the podium and about 16 floors of the building. The original name of this building was the Taipei World Financial center. In the year 2004, this was considered to be the tallest in the world and was for a long time until Burj Khalifa over took its label in the year 2010. The building was awarded the LEED platinum certificate in the year 2011 and also transpired to become one of the tallest constructions in the world. It was engineered by C.Y Lee and his associates. Its construction triggered off in the year 1999 and was completed after five years and was mainly constructed as a symbol of Asian tradition and technology. It is designed so proficiently that it can withstand earthquakes and typhoons and holds a multi-level shopping mall with hundreds of clubs and restaurants. The International commerce center is mainly a 108 floor scraper which is about 484 m. It was completed in the year 2010 and is situated in West Kowloon Hong Kong. It is mainly a portion of the Union Square project and is presently considered to the ninth tallest scraper in the globe in terms of its height. In Hong Kong it is regarded to be the tallest construction. The building is incorporated with 101 dining eateries, observatory decks, shopping malls, offices and also car parking zones. This building is said to hold the world’s highest swimming pool and also a bar known as the OZONE. With the list getting close, the PETRONAS tower also referred to as the PETRONAS twin tower is number nine in our list. It is also a colossal twin tower situated in KL, Malaysia. This building as per the record books was considered to be the longest between in year 1998-2004 and still is one of those tallest twin towers in the globe. This twin tower has about 88 floors and is specifically constructed on reinforced concrete accompanied with a glass and steel façade to resemble the motifs found in the Islamic art of the Malaysian Muslim religion. Another resemblance is the cross section of these twin towers which is mainly on the concept of Rub el Hizb. That completes out list of the top ten sky scrapers in the globe. Hopefully the segment was fun going through.